The linear progression of time is a harsh mistress. The Wife totally did this. It’s kind of amazing, but it’ll be nice when she finally gets her new glasses. Given the opportunity, I’m sure the Wife would Modge-Podge everything. Including the cats. Pregnancy rage is a serious issue. Ladies all unhinging their jaws and swallowing people whole. Serious problem. My wife’s glasses broke over the weekend. I fixed them, but then they broke again today. Again, we fixed them with superglue. 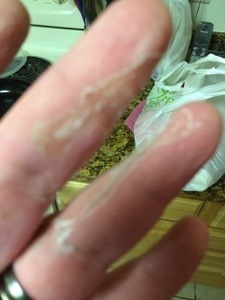 And managed to glue my fingers together. I can’t even explain why I find this idea so hilarious. I just do. It did rain during my walk Tuesday. Didn’t stop me, mind you, though I did cut my walk short to go home and cook dinner, though. The Wife covered her phone case in Modge-Podge this evening. It’s…it’s so damn glittery. It’s like this after every break, regardless of length. Three-day weekends have this effect. Regular weekends have this effect.